A Zebu is a cow with a hump. A Miniature Zebu is less than 42" tall, measured right behind the hump. They have straightish horns and are white, gray, almost black, spotted, and red. They are intelligent and active compared to "regular" cattle. 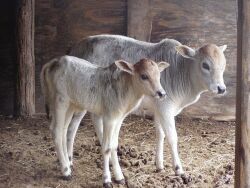 Miniature Zebu are very rare. Our Herd is Foundation Pure (fullblood). 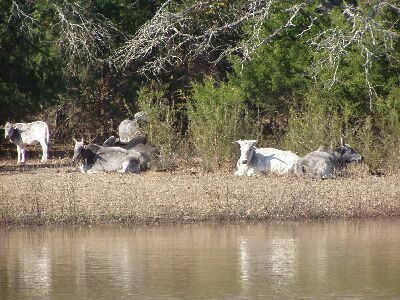 All Zebu mature slowly and rather late. Bos Taurus cows breed at 1 1/2 years; Zebu somewhat later. However, they are long-lived--18 to 20 years is average. We have been raising and breeding these wonderful little cows since 2002 and starting showing in 2005. Our herd consists of 15 cows, 3 heifers and 3 bulls. We have set high standards for our breeding program to produce show quality animals.